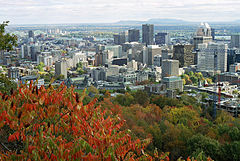 Montréal is the second largest city in Canada, the largest city in Québec, and the largest francophone city after Paris and Kinshasa. At the confluence of British Commonwealth, American, and Francophone cultures, Montréal is a center of cultural, academic and social activity. Host to the 1976 Summer Olympic Games and the legendary 1967 world's fair, and home to dozens of cultural and artistic festivals every year, Montréal offers a multitude of suitable venues and resources for Wikimania, as well as a warm, multicultural atmosphere to welcome participants. Wikivoyage has a travel guide for Montréal. Montreal (French: Montréal) (pronounced [mɔ̃ʁeˈal] in French, /ˌmʌntriˈɑːl/ in English) is the second-largest city in Canada and the largest city in the province of Québec. Montréal was incorporated as a city in 1832 and, by 1860, became the largest city in British North America and the undisputed economic and cultural centre of Canada. Montréal is easy to get to from most major destinations: over 200 U.S. and international flights touch down at Montréal-Trudeau International Airport each day, arriving from over 70 international and 25 Canadian cities. Montréal's compact, safe, clean downtown is a short ride from the airport. Montréal, at the intersection of Anglophone and Francophone cultures, is ideally situated to hold proceedings in both French and English. The inhabitants of Montréal are predominantly bilingual (French and English), especially in the service industry, and resources to hold the entire conference in both languages are readily available. Within Greater Montréal, with a population of 3.6 million, 53% of the inhabitants are bilingual and 20% use a third language in addition to French and English. Montreal's summers are warm, and at times humid, with average high temperatures of 24–26°C (75–79°F) and lows of 13–15°C (55–60°F). Montreal shares Canada's low violent crime rates, making it relatively safe. Montreal's emergency number is 911. Call this number in emergencies to contact police, medical attention, or fire. Most places in Montreal only accept the Canadian dollar ($), which is divided into 100 cents. Value of the Canadian dollar can vary from 70-110 US cents. Some tourist locations will accept US dollars. Sales tax of 14.975% is added to most items, except packaged food. Price tags usually only show the before-tax price. Tipping at a rate of 15% is expected in restaurants. ATMs attached to major banks accept debit cards connected to the Plus or Cirrus network. Independent ATMs might not accept foreign debit cards. Montréal has a Six Flags amusement park situated on Île Sainte-Hélène called La Ronde, the second-largest amusement park in Canada. It is accessible via car or public transportation (bus routes 167 or 169, or yellow line by metro). On the same island there is a water park, and a casino, if you'd like to try your luck. Montréal also has a well-developed tourist industry and multicultural population, if you'd like to walk, see the sights, or eat! Montréal has a diverse entertainment scene. There are large venues such as Centre Bell or at the Olympic Stadium. Home to a vibrant night scene, Montréal is always alive at all times of day. The Olympic Stadium for the 1976 Olympics is still open to the public. People can ride on the gondola to go up the inclined tower and admire the view (not free). Montréal is the host of the Festival De Jazz (Jazz Festival), Francofolies (French song festival), Juste Pour Rire (Just For Laughs) and a large number of happenings all year round; including the International des Feux Loto-Québec, the largest fireworks competition of the world taking place while Wikimania would be held. The International des Feux Loto-Québec lights the city evenings during summer, with countries vying to win the competition with explosive enthusiasm. Île Sainte-Hélène is home to a large wooded area, historical fortifications (pictured), an amusement park and a water park. Summer sees the streets of downtown Montréal fill with festivals and celebrations, such as the Just for Laughs humor festival. The nights are alive in Montréal; whether you're looking to catch a good meal or a good show, Old Montréal and the Quartier Latin will fill your needs. Montréal is home to many world-class museums such as the Montreal Museum of Fine Arts which hosts a large collection of precious works of art and a large Napoleonic collection that was given by Ben Weider. It's also the home of the Musée d'art contemporain de Montréal which hosts contemporary art exhibitions. For the science lovers, there's the Montreal Science Centre which is home to many science themed exhibitions and an Imax theatre. The Montreal Biosphère is home to a museum that is dedicated to water and the environment. In the Olympic complex, the former velodrome at the Olympic Stadium. The Montreal Biodome is home to many animals from all around the world. It's also home to a permanent collection of the Montreal Jazz Festival's collection of arts at the Galerie Lounge TD in the Maison du Jazz Rio Tinto Alcan. In 2010, The Galerie Lounge TD features the works of world-renowned Montreal native Leonard Cohen's art collection. The Montréal Botanical gardens host a permanent Insectarium where you can see the creepy-crawlies up close and personal. The Montreal Museum of Fine Arts hosts a number of permanent and travelling collections of note, and has free admission at all times. The Musée d’art contemporain de Montréal holds a large collection of modern and classical art for the connoisseur. Notre-Dame de Montréal Basilica displays its colorful and dramatic Gothic architecture to visitors. Summer in Montréal is home to many famous festivals certain to attract your attention, as well as a multitude of smaller activities and expositions. Every summer, the core of downtown plays host to the Festival International de Jazz de Montréal when more than two million people join for more than 650 concerts played over eleven days and nights, including 370 concerts staged outdoors and free of charge. The Just for Laughs festival, the world's largest and most prestigious comedy event, presents gala performances, theatre, club shows and outdoor free performances. With comedians, street performers and performances in French and English through most of the month of July. Explosive Saturday nights are guaranteed throughout summer as the Montréal International Fireworks Competition lights up the skies with pyrotechnicians from all over the world countries display their daring talent to compete in the most prestigious event of its kind. Montréal is home to some world-famous restaurants. Schwartz's is famous for its smoked meat. Poutine is also offered pretty much everywhere with different flavors. One thing that makes Montreal unique with New York City is the Montreal-style bagel. Wilensky's is also a must stop for their famous sandwiches. Montréal is home to many types of restaurants. Their concepts are often varied and unique. Some of them offer local cuisine or regional plates with a modern twist. World cuisine is found almost everywhere. 55 CAD (+ TAX) monthly plan: includes 750 MB data. 500 minutes calling inside Canada during the day (unlimited between 5 pm and 7 am), and unlimited texting. 60 CAD (+ TAX) monthly plan: includes 1 GB data, unlimited calling inside Canada. and unlimited texting. 70 CAD (+TAX) monthly plan: includes 2 GB data (2 cents per megabytes beyond 2GB), unlimited calling inside Canada. and unlimited texting. You can buy a Fido plan from Fido store in Montreal. You can buy a Telus SIM card from any Telus, Best Buy, or Walmart stores in Montreal. You can buy a Virgin Mobile SIM card from any Virgin Mobile kiosk or Sears stores in Montreal. This page was last edited on 11 August 2017, at 18:34.